The Maker application screen is divided into three sections: Menu/Toolbar at the top of the screen, Navigation Tree on the left side of the screen, and the main Drawing Panel. Button - General purpose On/Off push button. Label - Text display. Also allows embedded tag values by placing # inside the text. Image - Any GIF file. A limited library of GIFs is included. Fill - Fills the selected area (indicated by +) with On/Off color as determined by a tag value. Typically used to animate GIF images. Percent Fill - Fills the selected area (indicated by +) with a single color. The height of the filled area is determined by a tag value. Typically used to animate GIF images. Navigator - Switches the display to the selected screen. Line - Draws a line. The line width and color are configurable. Shape - Draws a rectangle or oval. The border color and fill color are configurable. List - A list of numbers and associated text values is entered in the Maker application. The Viewer application displays the text that corresponds to the numerical value of a tag. Real Time Graph - Up to four tag values can be displayed on the graph. The most recent 15 minutes of data is displayed on the graph. Older data scrolls off the graph. The navigation tree is used to manage Screens and Tags. The tree is used in the same way that Windows Explorer can be used to manage files and folders in the Windows operating system. Items can be added, copied, removed, and renamed simply by clicking on the tree. This is particularly useful for organizing tags in a hierarchical structure. For example, the entire CIP #1 tag folder can be copied and pasted into a new CIP #2 tag folder with just a few clicks. Then the new CIP #2 tags simply need to be re-assigned to its corresponding Server PLC address. Tags can be assigned to an element on the drawing panel by dragging the tag from the tree onto the element or by selecting the tag from within the element's properties dialog. Screens are designed by drawing elements on the drawing panel. Multiple drawing panels can be active at the same time, and each active drawing panel is displayed as a separate tab. After a drawing element is selected from the Draw menu/toolbar group, use the mouse to place the element on the drawing panel. The properties of an element are accessed by right-clicking the element and selecting Properties from the pop-up menu. A new window will open displaying the options available for the element. 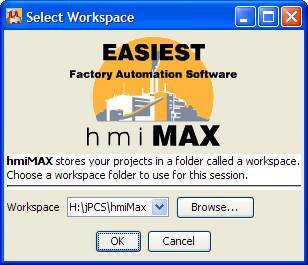 Each project designed with hmiMAX is assigned a workspace. A workspace is simply a directory on the computer. When the Maker application starts, it asks for a workspace selection as shown in the figure below.